LAFAYETTE, CO. - In just over a month, the USA Men's National Team will return to the pitch following their historic Americas Rugby Championship (ARC) title victory. With training camp beginning on May 27th in Denver, the Men's Eagles announce a roster of 30 players for the United States' 2018 June test series. Kicking off with the Emirates Airline Summer Series at home, facing No. 19 Russia in Denver (June 9) and No. 5 Scotland in Houston (June 16), the Eagles will close out their schedule in Halifax with a contest against No. 21 rival-Canada (June 23). Tickets to the Eagles two home matches of the Emirates Airline Summer Series are on sale now at usarugby.org/summerseries. Both matches will also be featured LIVE on The Rugby Channel with broadcast information for the final test match at rival-Canada confirmed closer to date. Of the 30 national team athletes entering training camp, more than half will join the squad from the newly formed Major League Rugby (MLR) -- the highest form of professional rugby in the United States. Having kicked off across the U.S. this April, MLR has provided consistent and challenging matches for domestic based players who will begin camp primed for the June internationals. "We are really excited about the group of guys coming into camp this month," said Head Coach Gary Gold. "After a successful start to the season and with the return of several key players, the men are anxious to begin training for three challenging test matches ahead." For the first time this season, David Tameilau, Samu Manoa, AJ Macginty and Eric Fry will make their highly anticipated returns to the international stage. Tameilau, currently with the Utah Warriors of MLR, last joined the Eagles in July of 2017 for their Rugby World Cup Qualifier win over rival-Canada. Manoa -- the equally physical and dynamic threat currently with Toulon -- and MacGinty -- the powerful fly half who recently inked a new four-year deal with the Sale Sharks -- both last wore an Eagle jersey during USA's November test match with No. 12 Georgia. Fry, who hasn't made an appearance with the Men's Eagles since November of 2016 against Romania, returns after successful recovery from injury. 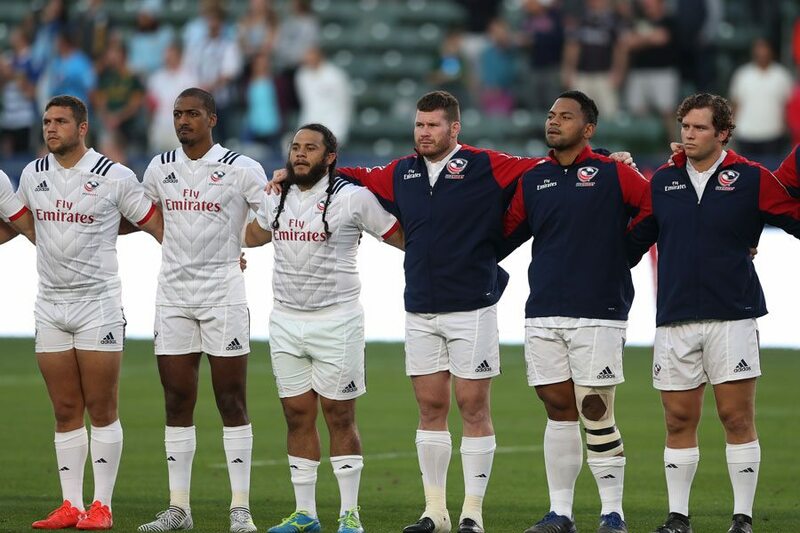 Accompanying the season debut of Tameilau, Manoa, Macginty and Fry are several Eagles exploding on the point sheet this season following the 2018 Americas Rugby Championship. Will Magie (38pts), Tony Lamborn (15pts) and Nate Augspurger (15pts) - three of the USA's Top 4 point scorers - all return for the upcoming June test series. Familiar faces in Captain Blaine Scully, Big Boy Hanco Germishuys and Cam Dolan are back as well, along with Paul Lasike who came off the bench to score during his international debut at the U.S.' final home match of the ARC against Chile. And with a group of well experienced athletes returning to the pitch, newcomer Paul Mullen will have an opportunity to earn his first cap in the front row. Complimented by the return of several standout players, the Men's National Team will begin training for the three-match June test series on May 27. Following camp, the squad will face Russia in Denver (June 9) and Scotland in Houston (June 16) as part of the Emirates Airline Summer Series, before closing out their test schedule against rival-Canada in Halifax (June 23). Tickets to see the Men's Eagles compete in the Emirates Airline Summer Series are on sale now starting at only $20 (Denver) and $23 (Houston). Seat options, hotel offers and other event information is available at usarugby.org/summerseries. Both matches will be broadcast LIVE on The Rugby Channel. Broadcast information for the United States' final June test match against rival-Canada will be confirmed closer to date while updates for all matches are available by following @USARugby on social media.